We help in providing training and tests for CSCS Card courses which employers are looking for. Apply for a Course TODAY and be on your way to a BRIGHTER FUTURE! The CITB test helps your knowledge on how to aware of health and safety standards in a construction environment. With this test you can qualify for getting the CSCS Card. We provide all CITB Tests that depends upon your type of work and role like Managers & professional test, labourers test , Specialist tests and much more. We are a leading training centre in construction industry in Southall, Birmingham areas providing CSCS card courses . Our experienced language instructors make individual learning plans to suit all ages, levels, interests and learning needs. Since 1st of July 2014 to apply for the New CSCS Green Labourer Card candidates need to do the New Level 1 Award in Health & Safety in a Construction Environment Course, as well as pass the CITB Health, Safety and Environment Test to be able to apply for the Card. Successful completion of this qualification will enable learners to apply for the Construction Skills Certificate Scheme (CSCS) Green Card which allows access to construction sites in the UK as a non-skilled worker. We have All-in-One Package is a hassle-free option which includes the Health & Safety in a Construction and we book the CITB Health, Safety and Environment Test for you and do the preparation for you. Our expert customer support agents guide you through the card application process. We help you get the right cscs card with a minimum of fuss. Proper use of equipments and tools like personal protective equipment , vehicles etc. We can come to you and deliver the training at your premises for £1000.00 (All Inclusive!) for up to 12 learners. 1. 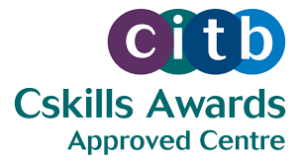 We are a CITB approved test centre for CSCS tests.